Our previous release history is detailed below. If you purchased the script within the last 12 months, you can download the latest release of the url script via your Wurlie account. v3.5 - PHP7 Support, Social Login Plugin, Facebook Login Fix, Performance Improvements and other minor fixes. - Social login included as standard in the core script. - Composer integration for third party libraries. - Fix to Facebook login (new API) on social login plugin. - Performance improvements on both the front-end and admin area. - Added support for MySQL Strict Mode. - Added support for punycode domain names. - Fixed issue with premium accounts not upgrading on certain payment gateways. - Improvements to mail handling when using php mail() functions. - Removed the requirement for MySQLi within the API. - Fixed issue with php mail() sometimes not sending. v3.4.2 - Performance Improvements, Nginx Support, MySQL Strict Mode Support, Punycode Domain Support and other fixes. - Support for Nginx web server. v3.4.1 - Minor fixes and improvements. - Option to block non registered users from creating urls. - Minor fix to paid account expiry process. - Displaying of paid account expiry date on the users account edit page. v3.4 - Offer Paid Account Upgrades, Case Sensitive Short Urls, Thumbnails, Tools and Fixes. - Added paid accounts option. Offer account upgrades via PayPal which hide ads. Enable via the admin area. - Full support for case sensitive short urls. - Bulk delete users/urls in admin area. - Added thumbnail of original site on stats pages. - Added tools section to list Bookmarklet, API & HTML Convert. - Added ability to export urls from the account_home.html page. - Edit url option in admin area. - Added a contact us form, with optional captcha. - Upgraded reCaptcha to reCaptcha2. - Improved the loading of favicons on short urls. - Added option in the admin area to either show or hide the captcha when creating a new url. - Optional private Url statistics via the account settings. - Optional delete url statistics in the edit url page. - Blocked autocomplete on the additional options fields. Caused submission issues in certain browsers. - All missing translations for the frontend added to the database. - Fixed issue with Google fonts not loading if using https. - Copy url(s), Copy Stats, & Copy QR code link when clicking an icon, icon changed color when clicked. - Added PPV Withdrawal methods. --- Added restrictions to "Max Limit By IP", "Max Limit By Url" and "Max Limit By User". --- Compacted the "PPV Country Rates" into a scrolling div to save space in the plugin settings. 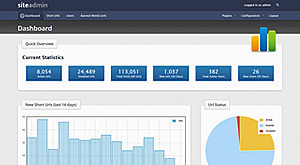 v3.2 - Interstitial Ads, HTML5 Charts, Log System, Pay Per View Plugin. - Added interstitial ads option for url redirects. - Replaced Flash charts in stats with pure HTML5 versions. Compatible with a larger range of devices. - Stats charts now resize for smaller screens such as mobile devices. - Changed older mysql_ code in database layer to PDO. - Fix to paging when filters used on admin area. - Fix to possible xss issue on delayed redirect page. - Updated plugin architecture to allow parameters to be used. - Added system admin notice when script upgrades are available. - New functionality to allow for additional short url domains to be added. - Set short url domains to be available to everyone or registered users. - Added folder management. Allocate urls to folders on the main screen, if you're logged in. - Option to disable main script url for creating urls. - Added optional captcha on registration form. - Migrated some missed text items into translations. - Better support for large databases. - Added option in admin area to permanently delete user and associated urls/statistics. - Added option in admin area to permanently delete a short url. - Added option to edit short url in members area. - Amended delete link in members area to permanently remove url. Option to disable or expire moved to edit page. - Amended banned words/urls feature in the admin area to support adding in bulk. - Updated API to allow for short url domain to be requested. - Migrated registration and lost password emails into translations. - Complete admin area rewrite. - Brand new replacement theme set for the front-end. - Responsive layout. Website resizes for use on mobile and tablet devices. - Support for creating multiple short urls at the same time. - Added plugin architecture for script add-ons. - Your Urls page converted to load data via ajax to increase performance. - Improvements to the speed of fetching favicons on 'your urls' page. - Only show active urls on right-hand url listing throughout the site. - Fix to expiry date option so it allows until mid-night to expire. - Added check for malware & phishing urls via Google Safe Browsing & Phishtank. - New API. Includes the ability to create, disable, activate, view info and list active urls using external applications. Responses in json or xml. - Minor big fix to translations which occasionally displayed a database error when inserted new translated text. - Added link to QR code after generating short url. - Added link to admin area in footer when logged in as an admin user. 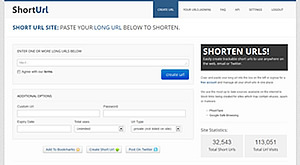 - Added short url statistics on the homepage. - Added option in admin area to remove the terms checkbox when creating short url. - Multiple language support. Added language bar in site footer so visitors can switch between different languages. Enable via the admin area. - Added optional public or private setting when creating short urls. Default is private for logged in users and API generated urls. - Added recent urls page to display public urls. Can be disabled via the admin area. - Fix to custom short url bug when expiry date selected. - Added option to use account key on API requests so short urls are added to an account. - Option to only permit API requests for registered accounts within admin area. - Added account settings page - change email address, account password, regenerate API key. - Added url status filter to url management page for users. Default view set to active. - Added optional captcha confirmation on create short url. Integrated with reCaptcha. Go via admin settings to enable. - Added QR code for each url. Available by adding ~q to the end of any url. - Formatting improvements to the short url confirmation page. - Added preview option for each short url. Add ~p onto the end of any url to view the original url. - Admin option to enable or disable API functionality. - Fixed advert config encoding issue within admin area. - Minor bug fix to double click 'edit user' within admin area. - Replaced share buttons with 'addthis'. - Direct redirect option on short urls now outputs 301 header instead of 200. Redirect override functionality. Within the admin area control which sites get directly redirected rather than loading within an iframe. Resolves youtube/facebook redirection issues. Fix for incorrect constant value on expireOldUrls() function call. In some instances/configuration urls could expire incorrectly. Fix to 'unknown' translation error on stats pages. Fix to correctly expire urls which haven't been accessed recently. Users can now register for an account in order to manage their urls, view stats and share their links. Minor bug fix to 'post to Twitter' functionality. Twitter removed support for the 'status=' method. Replaced with 'intent' API. The ability to view detailed stats on each short url. API released which allows for third party scripts/websites to integrate directly with the script. Minor bug fixes. Admin area and libraries to manage different languages. You can now set/add the site language within the site config and translate any content via the admin area. Translated content is visible both front-end and within admin. Other minor translation debugging tools added. Script initially released for purchase & download on MFScripts.com.